hnRNP AB antibody recognizes the heterogeneous nuclear ribonucleoprotein A/B, also known as ABBP-1 or catalytic polypeptide 1-binding protein 1. Rabbit anti Human hnRNP AB antibody recognizes the heterogeneous nuclear ribonucleoprotein A/B, also known as ABBP-1, apobec-1 binding protein 1, apolipoprotein B mRNA editing enzyme and catalytic polypeptide 1-binding protein 1.
hnRNP AB belongs to the subfamily of ubiquitously expressed heterogeneous nuclear ribonucleoproteins (hnRNPs). The hnRNPs are produced by RNA polymerase II and are components of the heterogeneous nuclear RNA (hnRNA) complexes. They are associated with pre-mRNAs in the nucleus and appear to influence pre-mRNA processing and other aspects of mRNA metabolism and transport. While all of the hnRNPs are present in the nucleus, some seem to shuttle between the nucleus and the cytoplasm. The hnRNP proteins have distinct nucleic acid binding properties. The protein encoded by HNRNPAB, which binds to one of the components of the multiprotein editosome complex, has two repeats of quasi-RRM (RNA recognition motif) domains that bind to RNAs. Two alternatively spliced transcript variants encoding different isoforms have been described for hnRNP AB (provided by RefSeq, Jul 2008). 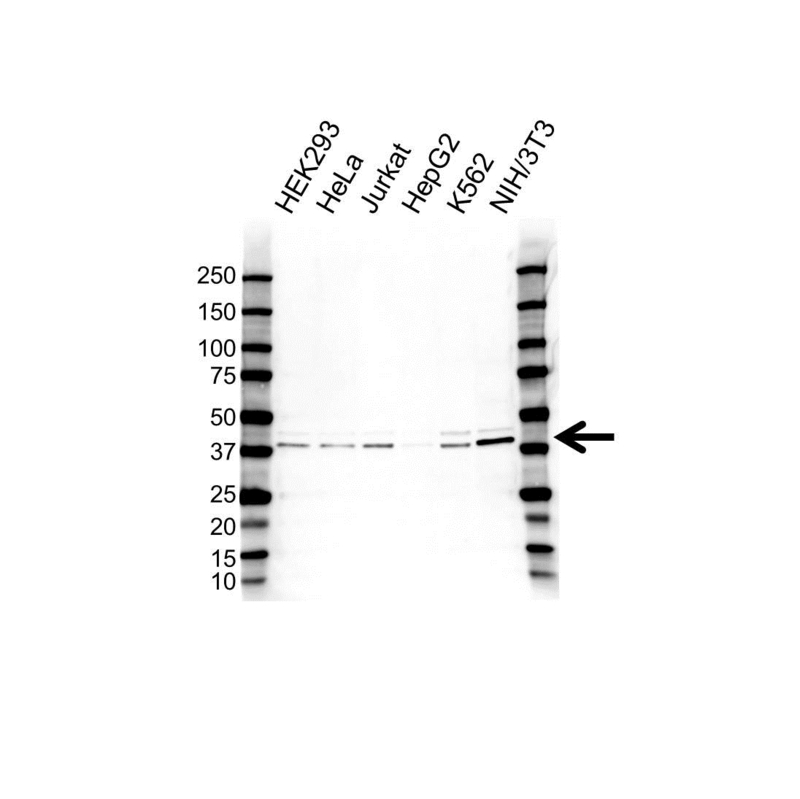 Rabbit anti Human hnRNP AB antibody detects a band of 42 kDa. The antibody has been extensively validated for western blotting using whole cell lysates.